The main feature of our latest version of our API (v8) is to be able to provide a detailed breakdown of taxes and fees including subtypes. If you are not supporting such breakdown, upgrading to the latest version will not bring any benefits for your hotel partners and therefore we would recommend you remain connected on API v7. 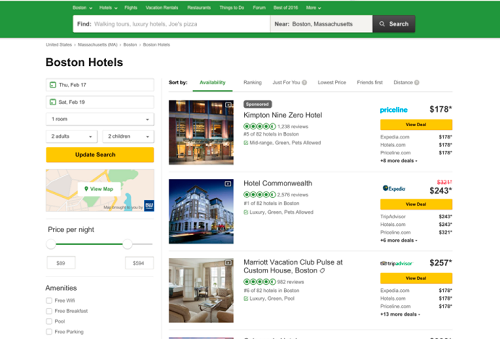 The newest version of the TripAdvisor API (v8) is designed to help Partners increase conversions by providing richer availability data to TripAdvisor. The document below highlights key changes and walks you through how you can use the new API. 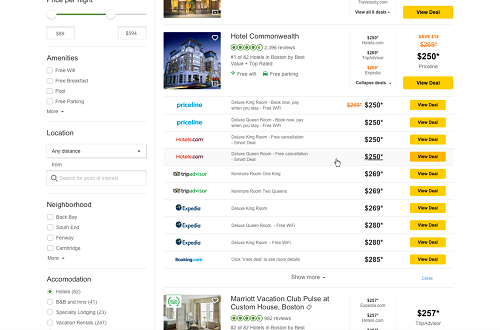 TripAdvisor's v8 API is described as a Swagger/OpenAPI specification file (http://swagger.io/specification/). Swagger comes with tools to autogenerate the model of the API into multiple different languages to make integrations with our API easier. In order to support your API implementation please use and download our v8 API Spec on Swagger. If there are any discrepancies between the documentation and the swagger spec then the swagger spec should be considered accurate. The new API supports a more detailed breakdown of taxes and fees. This is important because it will allow TripAdvisor to display taxes, fees and base rates in ways that are more relevant to each market. Upgrading to the new API will help you stay competitive and attract bookings from travelers looking for the lowest price. Specifically, we have added new subtypes in “line_items”, found under ‘hotels.available.room_rates’. We have merged Hotel Availability and Booking Availability by adding request parameters to specify the depth of data and caching strategy that you need to return in your response. This change will allow you to pass different content pieces based on the requested parameters. For example, we know that certain room and rate features – refund and cancellation policies, bed configuration, breakfast options and more – can influence booking decisions. BBy TripAdvisor requesting this subset of content in addition to the cheapest priced room, hotel shoppers will be able to see these features in the PriceFinder module on TripAdvisor, making them visible earlier and motivating potential guests to book with you. Detailed use-cases covered below. This single API endpoint allows the flexibly to change the information TripAdvisor requests in the future without requiring us to version the API (make breaking changes), and therefore without requiring any effort on the part of Partners. Detailed use-cases covered in section "How to leverage new API" below. Removed unused fields and functionality (such as "final_price" and "discount_type", or "adjustment" line items). Refactored how/where errors are communicated. Partners can maintain a single set of objects across TripAdvisor API functions (e.g. line_items and customer_support are objects that have been updated in /availability). We want partners to use the same object across the entire API. This provides a consistent experience to partners and lowers maintenance of multiple API versions. We are requesting partners to modify their current calls for Booking Submit, Booking Verify, Booking Cancel, Booking Sync. To reiterate this is not a large change and in fact will streamline your code that uses common objects across API calls. You can also view our V8 FAQ. In the line_items object under room_rates the API introduces a new subtype field with enumerated options to break down price information into several categories that are useful for consumers. See new "subtype" field below. An object containing the price of the line item. Describes the charge in more detail. Must be one of these values. The subtype must agree with the type. true if the charge will be paid at the time of stay. false if it will be paid at time of booking. City taxes are defined as taxes applied by a local city or municipality, collected from the traveler at the time of their stay. These taxes may be flat rate or % based. Transfer fees are mandatory fees charged by the hotel for transportation from the guest's point of arrival to the hotel itself. Environmental tax (sometimes called a green tax) are taxes or fees paid at the hotel at time of stay for impact to the local environment. VAT (Value Added Tax) or GST (Goods and Services Tax) are consumption taxes that may be paid at time of booking or time of stay. The single endpoint leverages flags/ fields “categories” and “category_modifiers” to request and receive different types of data from Partners. Each of these flags corresponds to particular sets of information in the response. The categories flags are set to true/ false based on the way TripAdvisor aims to present the data to customers. Whether or not we need these sets of data changes between requests and in particular could change in the future if we cache older responses - for example Room Type data is fairly static. The category_modifiers are particular types of data that can be applied each of the categories in a specific request/response. For example, if "photos" and "room type details" are both set to true, room type details with photos must be returned. However, if "room type details" is set to true and "photos" is set to false, the room type details returns does not need to include photo urls. The table below lists the categories and category_modifiers flags available in the API. if true, must include room type content such as name, (can be used with above modifiers). If true, non-cached pricing must be provided. This flag is only intended for requests for 1 hotel. Fields marked as real_time_pricing are affected. If true, multiple room rate offers must be provided, if available. 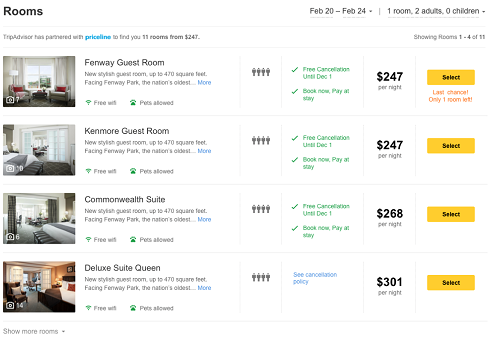 Fields marked as multiple_room_rates are affected. In the request, a requested flag points out which pieces of information are required. In the response, these flags indicate this information has been provided by the Partner to the best of their ability, there is not another call which will provide better information. Partner is responding with the exact set of data being requested. Partner is capable of responding with more data than what was asked in the request. This may be useful in case a Partner’s system does not allow you split content per the TripAdvisor requirements. Partner is providing the required pieces of information to the best of their knowledge. Best case, Partner provides all the content requested. Partner cannot provide this information at this time, either due to an error in the partner’s system / load capabilities. TripAdvisor may be unable to display the rest of your content. At minimum we expect to receive a single room-rate with the response flags set to all be false. Responses should include as much extra information as they can without incurring costs in terms of response time and rate of calls supported. If any of these fields are missing they will be interpreted as false. New flags may be added in the future in which case they should either not be returned or returned as false.